Now here is something different in the Studio: an honest-to-goodness old fashioned tech gadget review. 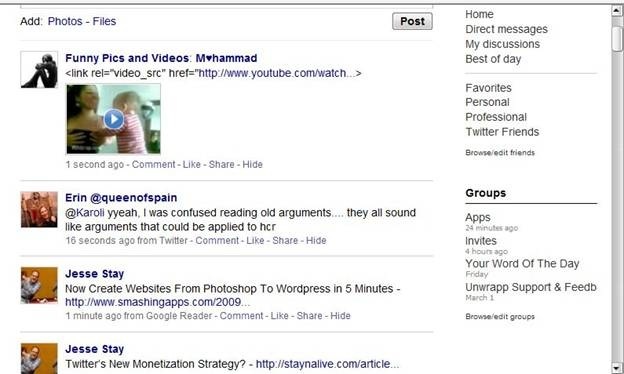 It was written for another gadget blog, but wasn’t used. Since I am all about recycling and repurposing, I thought I would publish it here. Hope you enjoy it. Nanovision. Mimo. Mimo Mimo Mimo. It’s just so much fun to say it. What is Martha talking about? 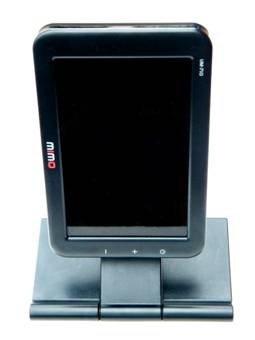 Nanovision Mimo is a little, 7” monitor that can be attached to your computer via USB. I purchased the diminutive screen to add to my laptop for viewing my real time social media feeds on their own dedicated billboard as I work on my main laptop screen. 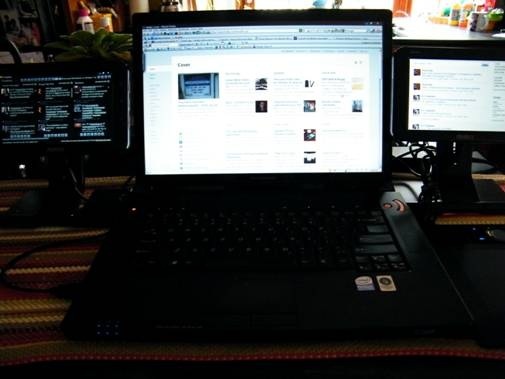 Because I found these little screens ably fill a definite need in my workspace, I thought I would review them here and share the experience of using them with you, the Gadgeteer reader. 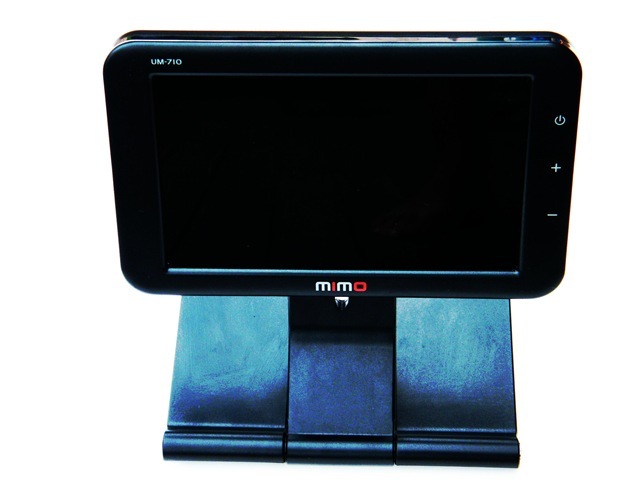 You may already know that the Mimo is a 7” display that can plug into your computer using a USB cable. You also may know maximum screen resolution is 800 X 480 pixels. 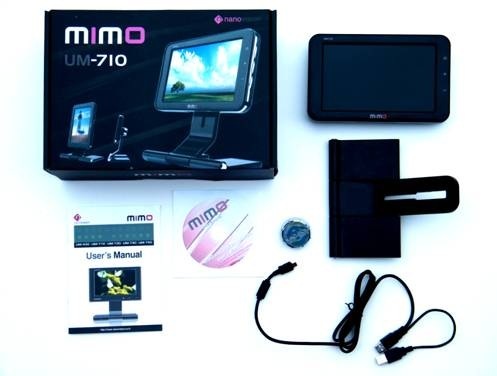 You may not know that the Mimo comes in multiple models, only two of which are available in the US: the UM-710, which is a straight monitor; and, the UM-740, offering a touch screen and built-in webcam and microphone. 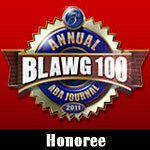 I will be reviewing the 710, which is the monitor I purchased and currently use. The Mimo UM-710 comes in small, slick, black, matte-finished box, well-packed and smartly dressed. The monitor itself is also small, slick, black, and matte-finished, as well as fairly lightweight for a monitor. It fits well my tight workspace – the corner of an island in my kitchen, taking up a mere 8 by 4 inch plot size. 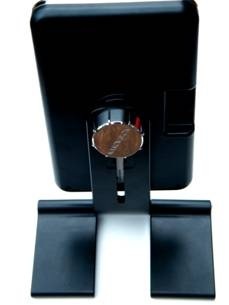 The 710 has a textured black surface on the frame and stand and four rubberized feet to keep it in place. It has a chrome strip along the outside edge of the screen and a large chrome knob in the rear that holds the screen to the arm on the base and allows for changing the screen’s orientation. It also has chrome caps on the hinge on the base of the stand, right where the screen arm meets the base. 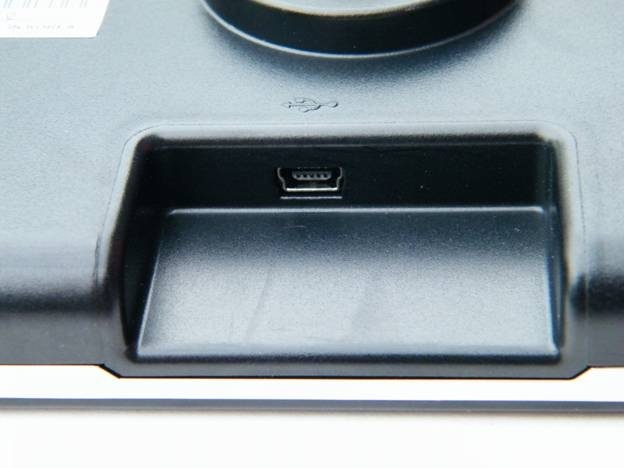 The Mimo logo appears right above the USB plug jack, in the middle of one of the long sides of the screen. The 710 is completely non-offensive, has a nice overall appearance and should look good in any setup. The 710’s interface is simple: three buttons, one for power, one for increasing the brightness and one for decreasing the brightness. The three chrome rectangular parallelogram-shaped buttons are along the right outside edge of the screen when it is in landscape orientation. There is no distracting power light on the Mimo. The 710 has no bells or whistles: there are no speakers, webcam or other familiar monitor add-ons. But that is o.k. in my book, as my best use of the 710 is as a secondary monitor on a system already equipped with these features. It was easy to set the 710 up and to start using it. Virtually plug and play. I run Vista Home Premium on my Lenovo Ideapad Y510 and have three USB inputs. I also run a Wacom Bamboo pen tablet, a Western Digital My Passport drive and occasionally plug my iPhone into the laptop via the USB. So I got myself a powered USB hub to expand the octopus, so to speak. One of the features that make this monitor so great for a tight setup, particularly on a laptop, is that you need only one cable to run it. Traditional monitors usually require one of those thick VGA or similar cables and a power cable, tethering you to a local power outlet. The 710 only requires the connection between the monitor and the computer, making it a good choice for a portable multi-monitor configuration. In my experience, however, the 710 runs better when it has dedicated power, and since its included USB cable splits into two plugs (one for power and one for video), the combined effect of running two monitors is the functional need for four USB ports. As indicated above, you can orient the Mimo in either portrait or landscape mode. Doing this is quite simple. The base attaches to the screen with that big chrome knob. The knob also serves as the pivot point for the screen. The base arm is slotted: you screw the knob through the slot and into the female end on the back of the screen. 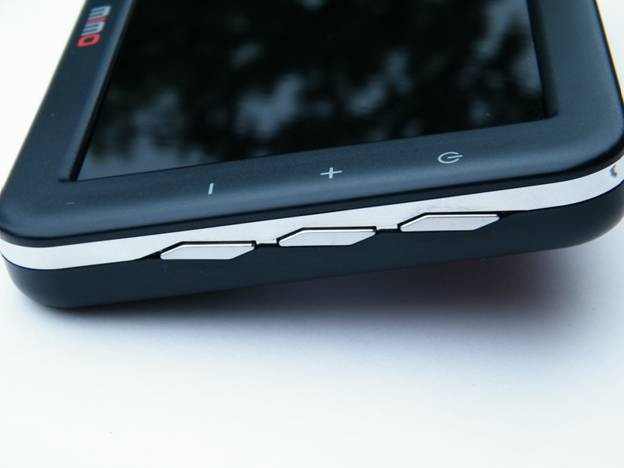 You can tighten the screw at any point along the slot, effectively raising or lowering the screen height. For portrait mode, you will need to set the screen at the top of the base arm slot. Just loosen the knob, grasp the front of the screen and turn and tighten the knob. In addition to the up and down and portrait or landscape adjustments, the joint where the screen arm meets the base also moves in a hinging action. You can tip the screen back and forth to find the perfect viewing angle, a process you likely will need to engage in, as I explain in further detail below. There is a slight issue with the USB cable. It comes out of the middle of the bottom of the screen in landscape mode. This means that you really only can turn the screen in one direction, depending upon where you have placed it relative to your computer and which way the cable is running. Also, while you can pull the cable out of the screen in landscape position, you cannot effectively plug it back in. You can reinsert by turning the screen to portrait mode, reinserting the cable and returning it to landscape mode. When I added my first 710 to this computer, I was running 2 GB of RAM on a 1.6 GHz Intel Core 2 Duo on the Y510. I initially plugged the USB into a powerless hub, but realized intermittent performance problems. Once I added power to the hub, the problems disappeared. Before I added the second 710, I added 2 additional GB of RAM to my laptop, hoping to ease the burden on the system. I can’t tell if it has made any difference, but I figure that the fact that I don’t notice a difference is a good thing. I first connected the monitors via the USB plugs before installing any software, but quickly realized I needed to install the drivers first. I used the drivers provided on the disc and the installation was effortless. Once the drivers were installed, an icon showing a little connected monitor appeared in the system tray. Hovering over the icon identifies monitor 3 and monitor 4 (monitor 2 on the laptop is my computer’s VGA port). Clicking on the icon opens a dialog box showing updates and allowing you to access each monitor’s settings. The selections include: screen resolution; color quality; screen rotation; extend to; extend; mirror; off; and, advanced. 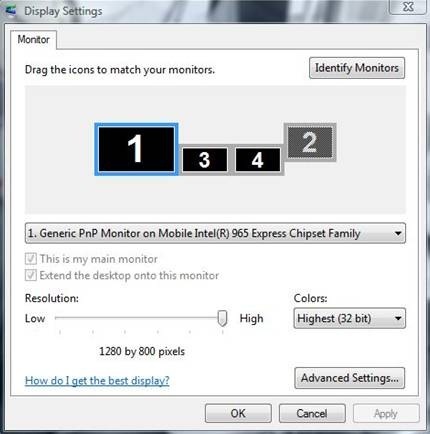 Advanced brings you into another box with the means to identify the monitors by a flashing number on each screen, to drag icons around to match your monitor set-up, to reveal a drop down menu showing all monitors on the system, and to adjust resolution and color settings. Another advanced button on this screen drills further down into adapter type and modes, screen refresh, trouble shooting, and color management. I keep it simple, with the highest resolution and best color settings and directions to extend the main screen left and right to the left and right Mimo monitors. Occasionally, the screens turn off. I unplug from my laptop the hub that they are plugged into, reset that plug and the screens turn back on. I do not have this problem when the monitors are plugged directly into the laptop, so I am betting dimes to donuts that my hub is the issue here. Occasionally, the screens re-orient themselves and the mouse no longer glides between the screens in my selected mode. I simply enter the settings and re-select either “extend left” or “extend right”, depending on which is misbehaving. I believe this to most likely be due to how Windows manages USB devices, rather than a Mimo glitch. Before grading the little Mimo on its screen looks, it bears repeating that the niche the little Mimo is intended to serve is a somewhat narrow one – as a small secondary monitor to a larger, more conventional set-up. The chances that someone is intending to use the 710 as their primary monitor should be nil to none. You won’t find dynamic display gymnastics with this little guy, but you will notice a clear stable picture. I wouldn’t recommend running graphics heavy programs or games on it or watching video. When I tell my friends that I am running a secondary 7” monitor on my laptop, they stare back in disbelief, wondering for all of the world how can I possibly see anything on it. The truth is that I can see just fine on it. I run Tweetdeck and Friendfeed on my Mimos and, sitting at my laptop at an approximately viewing distance of 16”, I can clearly see the small text on the screens both with and without my prescription glasses, which I need for distance vision. The monitors are set at mid-level brightness in my set up, approximately 8 feet from a wall of glass windows that permit entry to a lot of bright sunlight. The 710 is easy to view in daytime, low light and overhead task lighting at night. The up and down brightness buttons on the side are incremental and are not the press-and-hold type, meaning that you have to keep pressing them until you get to your desired level. Not a big deal for me, but it could annoy some. It is also not the best for stunt viewing from extreme sideways or overhead angles. The 710 starts washing out on me when I get to about 7 o’clock to its 12 o’clock. But this is a problem easily solved: the tiny monitors readily shift to proper angle and are highly adjustable. You will need to adjust the 710’s side-to-side and forward-backward position to find that sweet spot, but once there, the screen is clear and bright and easy to see. As I mentioned above, I primarily use the two Mimos I currently have on my laptop for Tweetdeck and the streaming Friendfeed. I also use them to house my tools in my vector graphics program Xara Extreme Pro and, occasionally, to show iTunes. 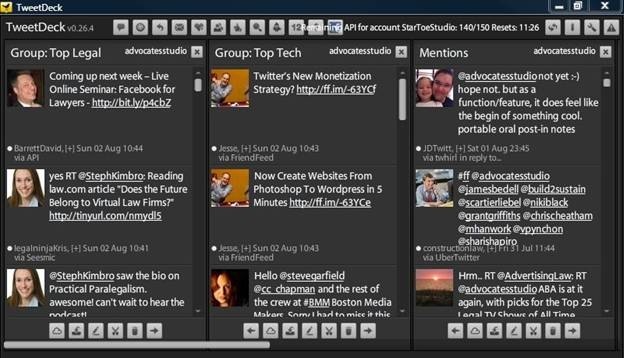 In Tweetdeck, the screen size permits three tweets down and three columns across in narrow column mode, which is fine for me, but might not be enough for true power Tweetdeck users. As I am working on my main 15.4” laptop screen in the center, I get peripheral information from the two screens that may alert me to turn my attention to a particularly interesting feed item or tweet. I have the screen settings on my computer to extend the screen left and right, so that I can seamlessly move my mouse left or right and access the secondary 710s on either side, enter text or hit a button and then return to work. The reality of my situation is that I do 98% of my work on this laptop, crammed into a less than convenient space in my kitchen. I have far more real estate in my office downstairs, where my desktop and 24” HP widescreen display reside and I could employ larger secondary screens there if desired. I don’t have that luxury at my preferred workstation. These little guys fit the bill perfectly for me in my tight quarters and more portable environment. Although I do not move them around much at all, except to clean under them, I easily can imagine packing the laptop and one of these little puppies in my bag and taking the show on the road. What you use the Mimo UM-710 for is up to you. I understand that there are some compatibility problems with this monitor on older Apple computers, before the Intel chipsets were added. I did not have access to a Mac running OSX to test out how the drivers work on that system. I have heard tell that the experience is not as positive as on a Windows PC. Number One Con: Price – $129 list seems high when you can pick up a monitor nearly three times the 710’s size on Buy.com for less than 710’s list, but there is a lot to be said for its USB convenience and maneuverable body type, which the larger monitors cannot match. I know this is a Mimo UM-710 review, but I felt I should point out a cool alternative I found when I initially was researching options for secondary screens on my laptop. Samsung makes digital picture frames that can be connected to a computer as mini monitors. The SPF-87H and SPF-105P are equipped with a feature called UbiSync PC, which allows the frames to connect via USB. The SPF-87H is an 8-inch screen offering 800×600 resolution and the SPF-105P is a 10-inch screen offering 1024×600 resolution. In addition to 1GB of internal memory, the frames also have a memory card slot if you want to use them as a digital photo frame. I haven’t used the Samsungs or even seen one in person, so I cannot offer a review, but I thought the multi-functionality aspect of these devices to be pretty darn cool. Plus, I am sure a larger screen size would be welcomed by many eyesight-challenged consumers. Great write-up! I got one of these a few weeks ago as a gift and I LOVE it. I have it on my nightstand as a basic info display: clocks (a few timezones); weather; who’s online via my IM; GCal list of up coming appointments. All of these are Vista Sidebar plugins (I use Piglet for Pidgin-very cool). BUT, I have a problem. There seems to be something wrong somewhere in the setup of my system or its drivers. When I close the lid of my laptop, all is well. Until I reopen the lid- then the screen settings get messed up. It ‘forgets’ that I have it setup to extend the desktop and instead mirrors it. It also has taken to changing my resolution, dropping it down a notch or even to 800*600 when I reopen the lid. And all this happens on log-in as well. The setup is an HP Pavillion DV7 laptop with an Intel Core 2 Quad at 2GHz with 6GB RAM and an ATI Mobility Radeon 4650 with 1GB set at 1600*900. It’s all up-to-date, including the ATI and Mimo UM-710 drivers. The UM-710 is set to extend my desktop to the side at its default resolution and color depth. The hardware manager shows one USB display device, both monitors (Mimo and laptop screen), and of course the ATI video device, all supposedly properly working. I tested with both USB cables plugged in with the same problems. I have them plugged directly into the laptop, no hub. Does it always happen? Loss of settings occasionally happens to me, but not necessarily when I close the lid. Perhaps a conflict between the Mimo driver and your video card? If you do find an answer to your question, I would really appreciate you coming back and posting it – I am sure others would benefit from your experience.